This week, instead of scouring the internet for new recipes, I decided to leaf through my first recipe binder. It’s a collection of recipes I wanted to try back when foodnetwork.com was still new, along with recipes from family and friends. One that caught my attention was Mario Batali’s Eggplant Parmesan. For one thing, it’s not fried so its healthier and its quick to prepare! Perfect for me. 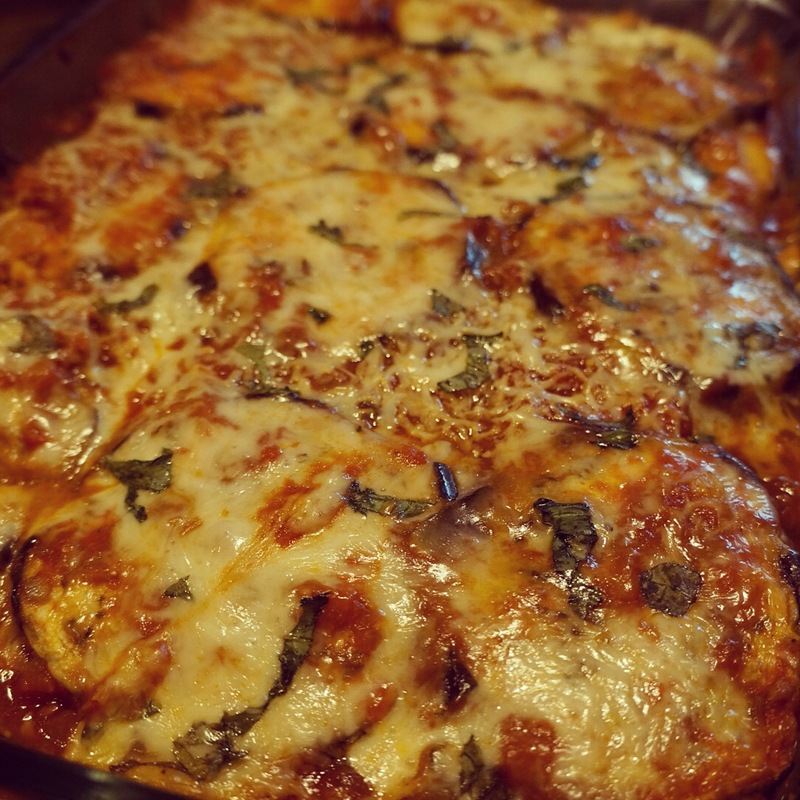 This dish is known for being tedious so I imagine my surprise when I saw “quick” and Eggplant Parmesan in the same sentence. 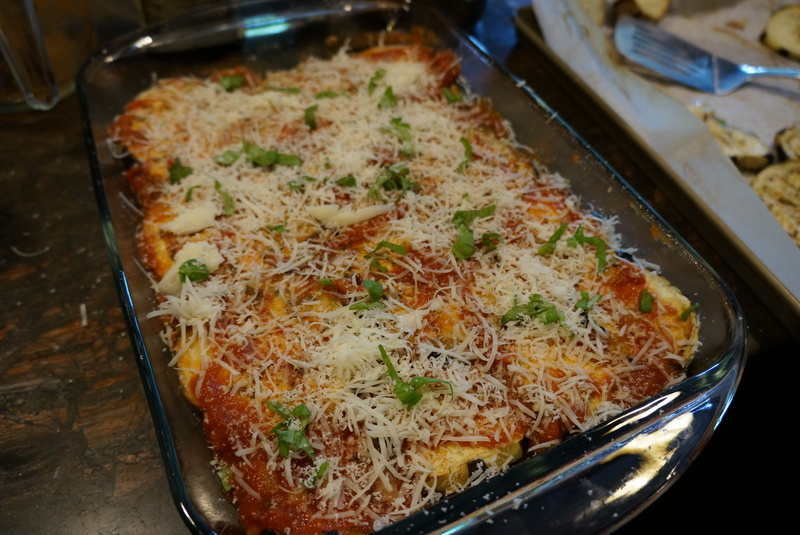 With a traditional Eggplant Parmigiana you would have to slice and salt your eggplant, wait 20 min, then pat them dry, then dredge each slice in flour and then in egg, fry each slice, assemble and then bake it. OMG!!! You need a whole day! Never mind if you have to make your sauce too! In the past I’d often buy this dish ready-made for that reason but no longer! The debate! Should you sweat your eggplant first or not? Wait…what? The step of salting to draw out liquid is sometimes called …excuse the expression…”sweating” the eggplant (I’m gonna gag) It is the process letting your eggplant excrete its bitter liquid. How does one do this? 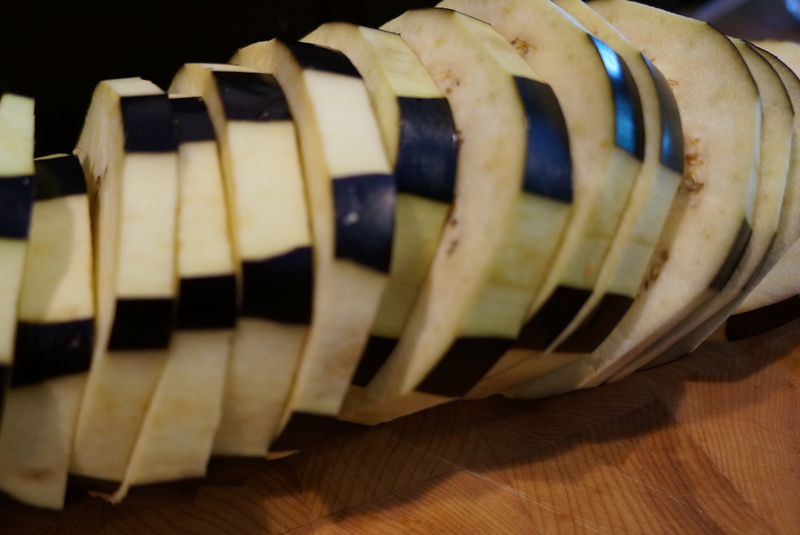 Slice the eggplant and salt liberally on both sides of each slice. Let them sit for around 20 minutes. You will see liquid coming to the surface. 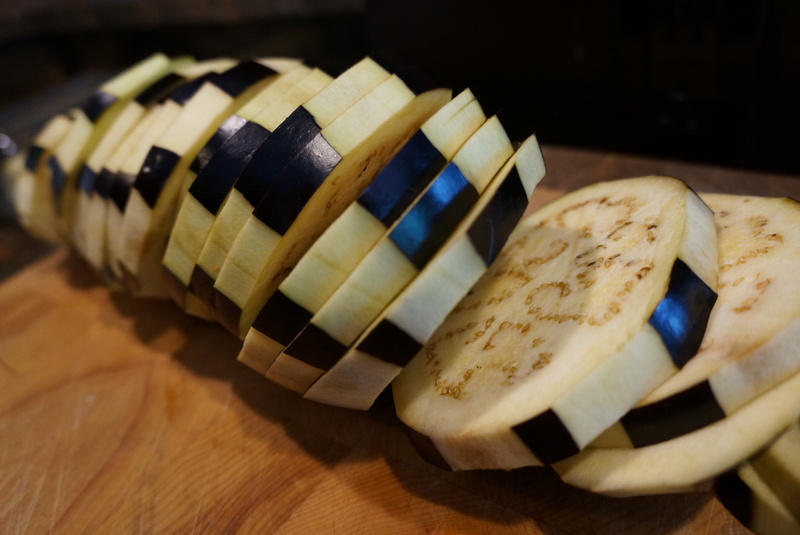 The slices become pliable; it tenderizes and prevents the eggplant from absorbing too much oil in the later steps. Blot them with paper towels and then brush with some oil and bake until cooked but not mush. So I guess you know where I stand. I still think it is best to sweat the eggplant although, you don’t have to. 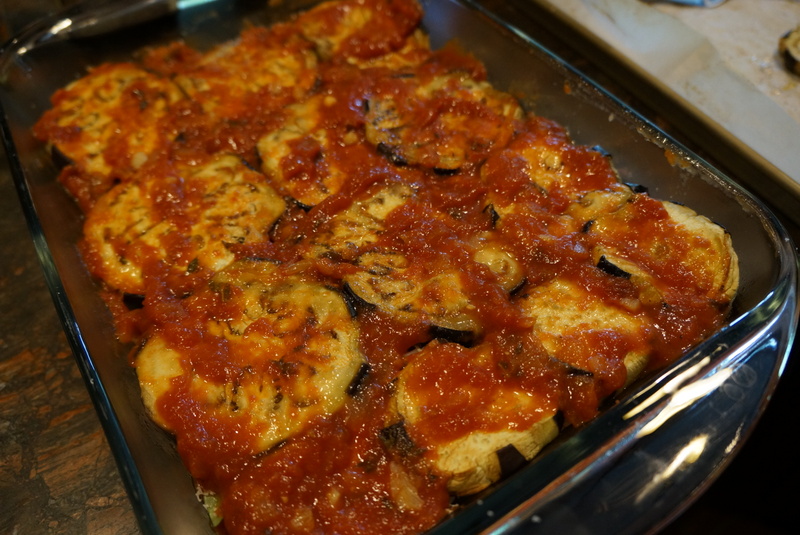 In this recipe, you can simply slice your eggplant, salt evenly and immediately bake them, remove from the oven, assemble with sauce and cheese and bake again. That’s it! In either case, it’ll taste amazing! I don’t like the eggplant skin very much so I peel it off leaving stripes of skin. This allows the rounds to keep some structure. If you remove all of the skin, they are harder to handle. 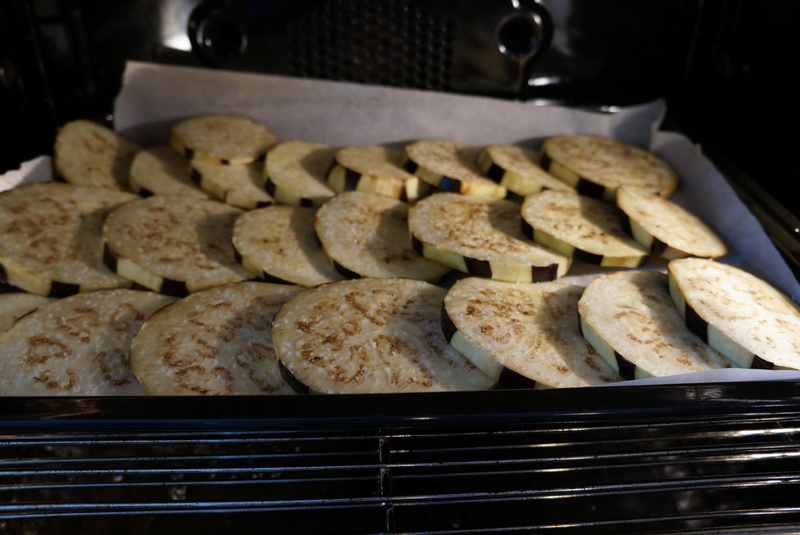 Cover your baking pan with parchment and brush it with oil before placing your salted eggplant slices on it. Parchment is my trick to prevent sticking. I use it often. Once your slices are baked (tender and lightly golden in color) , use a spatula to lift them off the parchment to ensure that they don’t break. Parmesan cheese is great but Pecorino Romano is better! Its slightly saltier and has a little bite to it. The addition of this cheese can improve any Italian dish – I am convinced. A 1/4 cup to 1/2 cup of sauce per layer should be enough. Spread it over the eggplant as shown. It doesn’t have to be swimming in sauce because when you bake it, more liquid will be excreted as the eggplant, cheese and sauce begin to break-down. Using some extra-virgin olive oil, oil a baking sheet. Slice each eggplant into about 1/2 an inch to 3/4 of an inch thick. Lightly season each disk with salt and pepper and place on the oiled sheet. Bake the eggplant at 450 degrees F until the slices begin turning golden on top, about 20 minutes. Remove the eggplants from the oven and allow to cool a little. 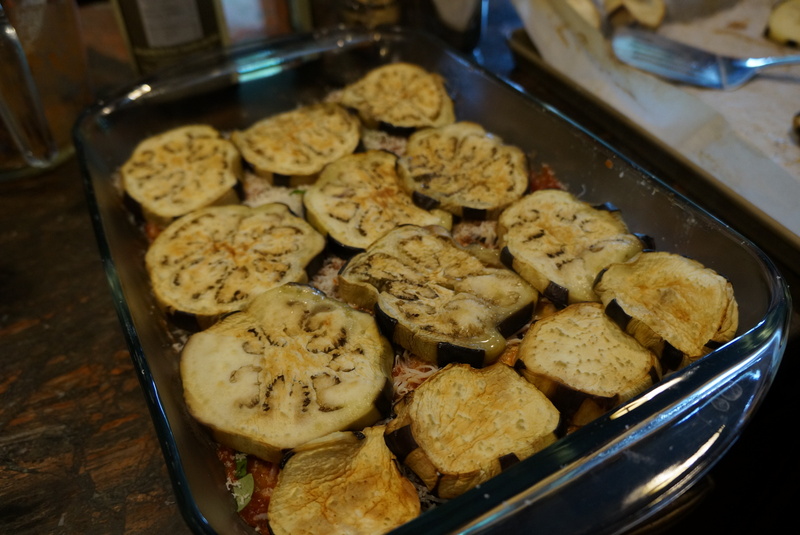 Optional – Sprinkle the toasted bread crumbs over the top of the eggplant dish. Bake covered with a layer of parchment and cover with foil, until sauce begins bubbling. Remove foil and bake uncovered until tops turn lightly golden. Let it cool for 5-10 minutes & serve. In a 3-quart saucepan, heat the olive oil over medium heat. Add the onion and garlic and cook until soft and light golden brown, about 8 to 10 minutes. Add the thyme and carrot and cook 5 minutes more, until the carrot is quite soft. Add the tomatoes and juice and bring to a boil, stirring often. Lower the heat and simmer for 30 minutes until as thick as hot cereal. Season with salt and serve. This sauce holds 1 week in the refrigerator or up to 6 months in the freezer. SPEED THINGS UP! My favorite jarred sauce is Stefano Faita’s Marinara. Its the best and most authentic tasting! 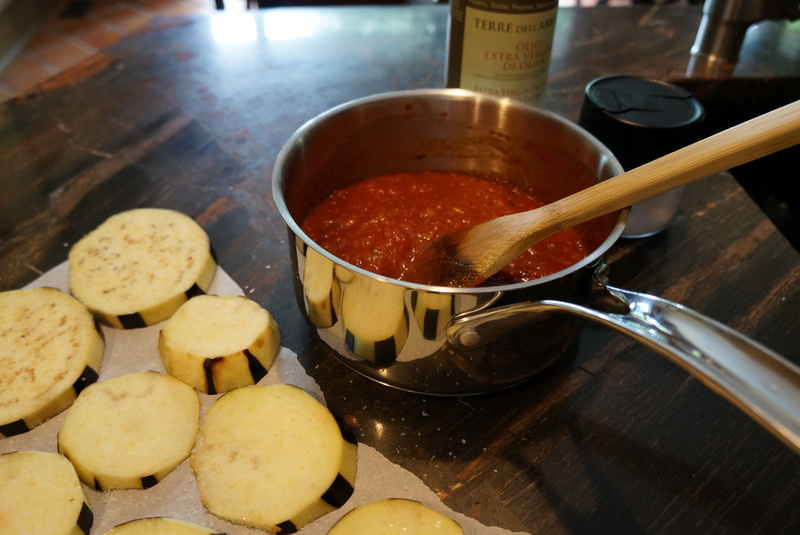 1 Jar of this sauce is suitable for about 2 large eggplants so you will need 2 jars if using this recipe as a guideline. Slice your eggplant about 1/2 an inch to an inch thick. “Sweat” and bake the eggplant in one step!